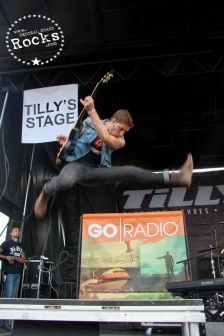 This year we interview : Go Radio, Echosmith and MC Lars at Warped Tour Ventura ! A Go Radio record isn’t so much meant to be listened to as it’s meant to be experienced. Go Radio have more in mind than just their ultra-catchy melodies. They craft songs that climb inside the listener’s heart and mind, establishing deep roots through shared experience and expression. The Tallahassee, Florida based quartet – comprised of Lancaster, Matt “Burns” Poulos (bass), Steven Kopacz (drums) and Alex Reed (guitar) – stands apart in their willingness to put it all on the line for their craft and each other. In an age where many groups do whatever is fashionable to become as popular as possible, Go Radio puts honesty and integrity first in front of any careerist concerns. The familial bond and true brotherhood within the group takes priority. New album 'Close The Distance' is now available via Fearless Records, featuring the song "I Won't Lie". Central Coast Rocks: You guys are playing all the Warped dates this year and we are on the seventh day in, how are the shows going? Alex Reed: Awesome, really surprising. We’re an East Coast band, we’re from the other side of the Country (Laughs), so to be out here and to see the crowds as big as they are is definitely blowing our minds every day. Central Coast Rocks: Tell us what it means to you personally to be on Warped Tour? Matt Poulos: It’s really cool. We did it in 2011 and it was like a breaking in experience. All of us grew up going to Warped Tour so it’s special for us. 2011 was like the time that was like “Wow” I can’t believe we’re out here. But for 2013 we’re able to see the growth of the band over the past two years and then be out here again and drawing more people and being able to enjoy it in a completely different way, I think it’s been pretty nice. Central Coast Rocks: Would it be fair to say Warped Tour was an aspiration for you guys to play growing up then? Alex Reed: Absolutely. I think it’s definitely a Milestone that you always want to achieve, for sure. Central Coast Rocks: High Energy with Great Rock n Roll tunes mixed with crowd interaction…..
Alex Reed: Nailed it ! Alex Reed: Somebody actually came up to me today and told me that they’re just blown away, that the fact that we go…. we have a lot of ballads, we have a lot of slow melodic songs and they were impressed at the amount of energy that we put in even in the slow songs, where other bands don’t do it. Matt Poulos: I always wondered about that, if people look at us like we’re insane because we freak out on some parts of the slow songs (Laughs), but that’s just what we feel so that’s what we do. Alex Reed: I know that we’re doing some headlining shows, some College Shows in September. Hopefully doing a Headliner in the Fall. Matt Poulos: Writing too, the last album came out coming up on a year ago so it’s about that time to start getting songs together. Alex Reed: We always say Thank You. We feel honored and blessed, we have the best fan base ever. I feel like we have a semi cult type following where they just really care about our band, so Thank You. Our album’s out now called “Close The Distance,” “I Wont Lie” is the single. Come on out to the rest of the Warped Tour. Matt Poulos: Party On ! 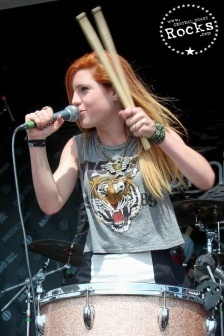 Echosmith is an American pop-rock band formed in February 2009 in Southern California. The band is composed of four siblings ranging from 14 to 20 years old: Graham, Sydney, Noah, and Jamie Sierota. Formerly known as Ready, Set, Go!, the band officially changed its name to Echosmith after being signed by Warner Bros. Records in May 2012. Their first single, "Tonight We're Making History," was released June 5, 2012 and was featured in a NBC promo for the 2012 Summer Olympics. Echosmith unveiled their new single and official music video "Come Together" in early June 2013. The band is currently recording their debut album and you can Download their Summer Sampler EP for Free on their Website. 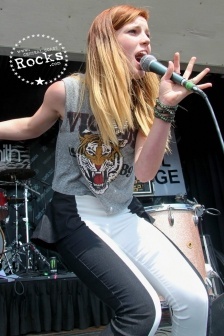 Central Coast Rocks: It’s the 7th day of Warped Tour 2013, how are the shows going so far? Jamie Sierota: It’s been going super great, I feel like every day is getting a little better as far as performance, selling merch and the crowds. Sydney Sierota: All the work is paying off. Central Coast Rocks: All you guys are still in your Teens. Did any of you attend Warped Tour when you were younger and was it an aspiration of yours to play the tour one day? Sydney Sierota: Jamie’s the only one who actually went. Jamie Sierota: Yeah, I went to the tour in High School. It was super cool and I went to this location (Seaside Park) in Ventura 2010. I would have never thought I would be here playing a couple years later, so we’re super stoked to be doing this. Sydney Sierota: We just put out a three song Summer Sampler that’s free to download on our Website Echosmith.com. We are finishing up a full length record hopefully to be released later this year or early next year. Central Coast Rocks: You guys grew up in a musical household, at what point did you realize pursuing music full time was going to happen? Jamie Sierota: We grew up in a very musical family, our Dad’s a music producer/writer so we just grew up around it, grew up in the studio and all playing music. It’s just part of us and who we are. Noah Sierota: It’s a very natural thing for us to play music and to be creative, so for us it’s like what else would we do? Central Coast Rocks: Describe your live show and do any shows you have performed so far stand out for you personally? Jamie Sierota: As far as our live show the most important thing for us is to have fun. Usually when you see a band and they’re having fun you can see it and you end up having fun too. Sydney Sierota: These Warped Tour shows have been great and we toured with Owl City earlier this year and those were great shows. We played with Twenty One Pilots in Santa Ana at The Observatory and that was insane. The audience was so into it, that was really awesome. Central Coast Rocks: Plans after Warped Tour? Jamie Sierota: We just want to keep playing live this whole year. Sydney Sierota: We’re playing Citywalk in L.A. with The Summer Set on September 1st I believe, so that will be a lot of fun. Sydney Sierota: Please visit Echosmith.com and get all the details and links to social media to be updated on everything and download the free Summer Sampler. Noah Sierota: We Love you All ! MC Lar’s latest release, the Edgar Allen Poe EP is out now. Central Coast Rocks: I know you’ve played the tour before. It’s the 7th Day of Warped Tour 2013, how are the shows going? 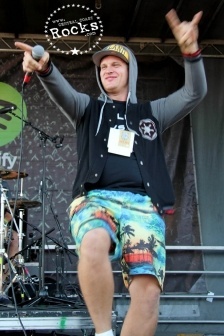 Mc Lars: They’ve been good. It’s my second full year, third year of being part of it and I feel more people are coming to see us. Like the fact that… you know the first year was more like a novelty, this year I’m getting more respect. Mc Lars: It’s like one of the last vestiges of this kinda fringe culture, you know what I mean? Punk has hybridized with Rap, and Dub Step and Trap Music and Ska, so it’s just an honor to be like the who’s who of the subculture this Summer, you know what I mean? It’s just one of those legacies as the world changes and everything it’s cool that the Warped Tour can still function. Even though it’s not as topical as like a Coachella or something, it’s still here. And that gives us hope for the Punk community. Mc Lars: I always wanted to play it, I didn’t go as a kid, my first time seeing it was when I was playing it in Dallas. I had friends who went and I would go to similar festivals like Bamboozle and all those kind of things. It’s pretty cool to be here. Mc Lars: I just put out the Edgar Allan Poe EP, and I do what I call Lit-Hop, so I’ll take 19th Century writers like that and turn their stories and poems into songs and its seven songs all Edgar Allen Poe based. It has The Dead Milkmen on there, my friend Random, who’s a Rapper from Philly. 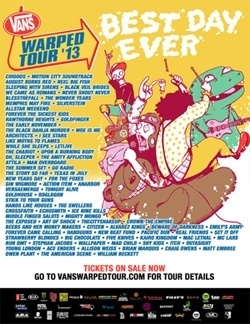 The single “Flow Like Poe,” is on the Warped Compilation. We premiered it at Carnegie Hall last year at The Scholastic Art & Writing Awards. So it’s kinda cool to go from Carnegie Hall, to Warped Tour (Laughs), you know what I mean? But it works, it’s Educational Rap. Mc Lars: I’m working on a kid’s show it’s called “Yes Yes Y’all” it’s Hip-Hop themed kinda like School House Rock, but more School House Rhyme, you know what I mean? It’s me and these Robot characters, we travel through time and meet people throughout history. For the Pilot we’re talking to Weird Al about being Marcel Duchamp, teaching them about the mustache on the Mona Lisa and Post Modern Art Dadaism. We’re gonna meet Shakespeare, he’s gonna tech them how to Rap, you know what I mean? We’re working on it right now, we’re shooting the Pilot in the Fall. If you go to www.McLars.com you can see a little preview of it. 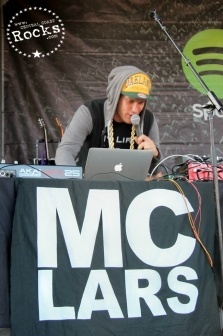 Mc Lars: Usually in The Club I DJ with my Lap Top, I have an MPK where I do Drum Beats and I have Video Projections so it’s like a live Video Multi-Media Show. On Warped I have a Drummer with a click track playing along and I’m doing beats on the Lap Top and I’m Rapping. And I’m starting Mosh Pits and doing the Ska-Skank Pits and everything so it’s a weird hybridization. I’m on the Spotify Stage which is mainly Dub-Step, Electronic and Hip-Hop guys, and there I am doing like the Punk Rock version of that. Mc Lars: I’m going back to Europe with this band Wheatus, I’m writing a book “The History of Hip Hop,” how Hip Hop remixes the past in pretty cool ways and working on the kid’s show and we’re working on a few records. We’re doing a kid’s record and the fourth Mc Lars record, which I started production on. So its cool man, I’m so excited about the future, it’s beautiful. Mc Lars: My advice to anyone trying to get into music is be creative, do your own thing. Because if you try to copy what’s trendy you’ll be irrelevant really fast. So instead of having one or two influences, combine all your influences and you’ll synthesize something truly beautiful, that’s my motto for life. About the Vans Warped Tour: The VANS WARPED TOUR® is well established as America’s premier music and lifestyle festival of the summer, breaking up-and-coming indie talent as well as both creating and showcasing major established artists since 1995. The nationally-renowned festival is the most eclectic traveling tour and features a diverse array of artists–with hotly tipped acts in every genre from punk, metal and indie to rock, hip-hop, rap, EDM, reggae and pop; as well as a variety of lifestyle attractions for its traditionally low ticket price. The tour has cemented its place in history by bringing punk rock/skate/action sports culture from the underground to the forefront of global youth culture, while at the same time helping those in need and being the first tour to consistently use groundbreaking environmental concepts every year on the road. The Warped Eco Initiatives (WEI) focus on making the tour more environmentally friendly whether it is through eco conscious catering for the artists and crew courtesy of Tada Catering or a solar-powered sound system on the Kevin Says Stage. Further, www.vanswarpedtour.com even showcases public transportation options for every tour date and carpool social media apps as well as exotic eco travel contests. 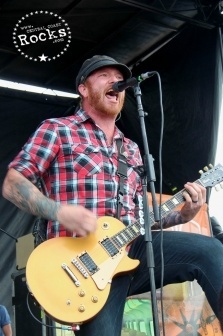 For more information on the tour that Alternative Press readers voted the “Best Tour/Festival” of 2009/2010/2011/2012 and Rolling Stone called “America’s most successful festival” (2005) go to: www.vanswarpedtour.com. Now in its 19th year, the 40-date tour commenced June 15 in Seattle, WA and finishes August 4 in Houston, TX.